The software giant Microsoft today said it will commit to a three-year philanthropic effort to help one million U.S. students from low-income families get broadband access to the Internet. The aim is to help bridge the so-called “digital divide,” a blanket phrase that’s used to sum up the social and economic difficulties some people face when they don’t have the same easy access to the Internet that so many people almost take for granted. Microsoft made the announcement at the annual meeting of the Clinton Global Initiative, the philanthropic organization run by former President Bill Clinton. The meeting is getting underway today in New York. The problem Microsoft is trying to solve is sometimes called “digital exclusion.” Think about how much you rely on day-to-day access to the Internet at home to do your job, and then imagine your life without it, or with only spotty access. There are lots of families with school-age children who are at a disadvantage because they don’t have access at home, or because their families can’t afford computers or the monthly fee for broadband. Lacking that access has a lot of long-term economic repercussions, none of them good. Without access, kids don’t perform as well in school, because they don’t have the Internet to help them with homework. And while there are usually other socioeconomic forces to consider in these cases, having not done well in school, these children have a greater tendency to not finish high school; therefore they don’t go on to college, and later on have a harder time finding meaningful work. 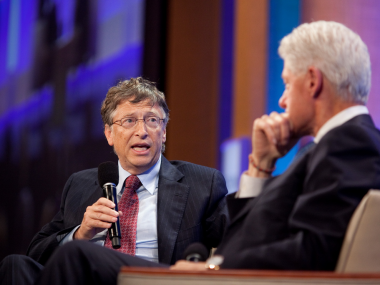 The irony, of course — at least to anyone who remembers how Bill Clinton’s Justice Department so vigorously pursued Microsoft through the courts during the 1990s — is how friendly Clinton and Microsoft co-founder Bill Gates seem to have become in public. The photo is from Gates’s appearance with Clinton at last year’s CGI meeting.